Located in the Bishnupur District in Manipur, the Keibul Lamjao National Park is the world’s only floating national park. The park contains many exclusive species of flora and fauna including the Brow-antlered deer, Hog deer, Wild boar, Large Indian Civets, common otter, fox, jungle cat, golden cat, Bay bamboo rat, musk shrew, common shrew, flying fox and Sambar. The park also includes a number of reptilian species indigenous to this area with a variety of snakes (venomous and non venomous), tortoise, lizards etc. The park is also home to a huge number of migratory and resident bird species making it a wildlife photographer’s delight. Located at a village near Sadu Chiru, Leimaram waterfall is a famous picnic spot. The place lies at a distance of 27 kilometers from Imphal in the Senapati District. The waterfall consists of three different falls with the first one being 30 meters high. One of the most popular picnic spots in the state and is easily accessible via a pleasant drive via the national highway 150. The surrounding area has been left inhabited and free from encroachment to maintain the natural surroundings. There vicinity of the falls are lush green and offer a serene and playful environment to its visitors. 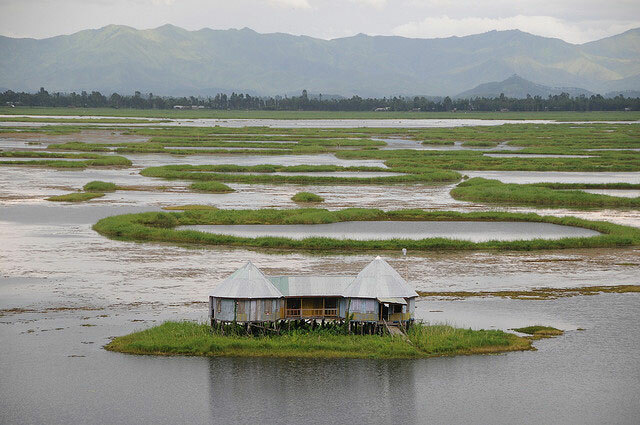 Also called the floating lake, Loktak Lake is the largest freshwater lake in India. The name is due to its floating Phumdis which is a heterogeneous mass of vegetation, soil, and organic matters at various stages of decomposition and is unique to this lake. The lake is also the source for hydropower generation in the state of Manipur and a major fishing ground for the rural fishermen. The lake is a rich bio-diverse area and is home to a huge number of unique flora, fauna and avi-fauna. The Keibul Lamjao national park is also located at this spot. For the tourists there is a amazingly located cafeteria atop a Phumdi and offers the visitors a perfect view of the surroundings making it an ideal spot for photography. An old palace/fort located on the banks the Imphal River, Kangla fort was the former seat of the Meitei rulers of Manipur. The palace use to be on both sides of the bank but as of today only ruins remain of this formerly majestic palace. It is considered to be the most important historical and archeological sites in Manipur as the very establishment of the kingdom of Manipur took place over here. The place was battered by many battles and vandalism by the enemy forces and the British, which has led to its current state. However, the fort is undergoing restorations under the Concept Development Plan (CDP) of ‘Kangla’ Fort Archaeological Park with many of its sculptures like the ‘Kangla Sha’ which have been restored. Built in the 18th century under the rule of Rajarishi Bhagyachandra, Shri Govindjee Temple is simple in design and is built with bricks and Burma teak. The double dome of the building was originally painted with gold leaf but after the British conquest was sold in a public auction. The main deity of the temple is carved out from the bark of a jackfruit tree which is an incarnation of Lord Vishnu. The place is often populated by the visitor and the main hall is a frequent spot for various cultural celebrations. The nearby pond adds to the beauty and serenity of this place. Inside the temple premises there are replica footprints of Lord Krishna in cement. The best time to visit the temple is during the festival of Holi where boys and girls perform the Thaba Changba folk dance. Manipur State Museum was founded in 1969 and has been since instrumental in the preservation, conservation and display of various cultural artifacts and historical information of the state of Manipur. The museum houses various paintings, manuscripts and artifacts which are all displayed in its huge galleries. Known for its various programs which involve the conservation of biological specimens and cultural heritage, the museum is a must visit for every visitor. The opening hours of the museum are between 10.00 am – 4.30 pm from Monday to Saturday and are closed during Sundays and other national or state holidays. Located at a height of 2,438 above sea level, Dzukou valley lies at the borders of Manipur and Nagaland. The valley is a photographer’s paradise and is a breathtakingly beautiful picnic spot with its rich cover of seasonal flowers and other flora and fauna. The valley takes its name from the Mao word with its literal translation being ‘cold water’ which refers to the perpetually flowing stream of water through the valley. The place is nearly untouched by any sorts of modern encroachments and changes shades according to the changing seasons. To make the stay convenient for the visitors there is also a rest house here that offers cheap accommodation and instant noodles in case you forget to bring any food supplies. The valley is a personal recommendation for all the people who plan to visit Manipur. Located at a distance of 8 kilometers from Imphal, the Manipur zoological park was inaugurated on the 2nd of October 1976 and covers an area of 8 hectares. The place is known for its captive breeding program of the endangered Brow-antlered deer or the Sangai. Often termed as the ‘Jewel box of Manipur’ the place serves as a home to several rare and endangered species of birds and animals with over 55 different species. There are a number of accommodation facilities available for the visitors and the stay is, in most cases pretty cheap and affordable. One can also visit the Manipur Agricultural University which lies towards the southern area of the park. The famous tourist spot is located at a 16 kilometer drive from Imphal which is equally picturesque as the destination itself. Snigda dam is characterized by its calm and serene environment and a sedating climate that makes it an excellent picnic spot. The dam is located at an altitude of 921 meters above sea level and overlooks an artificial lake and the Manipur valley. The accommodation is facilitated by a health resort and an inspection Bunglow which makes stay convenient for the visitors. The spot offers panoramic views of the whole valley and is perfect for photography. Located at a distance of 39 kilometers from the Maram Village in Manipur, Willong Khullen is characterized by its numerous stone erections which are similar to the stone hedge. The tallest of the stones are as high as 7 meters and are about a meter in thickness. The place is located on the slopes of the valley and offers a serene picnic and resting spot for the travelers. It is said that the stones are uncountable as there is a spirit that would confuse you midway while counting. The aforementioned places are just a handful of what this majestic state has to offer. The various tourist spots, festivals and cultural heritage of the state are pretty vast and unique to be contained into a single article. However, this is our best attempt to mention and highlight the must visit spots in ‘The Switzerland of India’.